Ana Mardoll's Ramblings: Author Interview: Trey Watson on "Mac The Fire Truck and The Airplane Fire"
Author Interview: Trey Watson on "Mac The Fire Truck and The Airplane Fire"
Ana: Today we have Trey Watson introducing their book, Mac The Fire Truck and The Airplace Fire. I haven't read this book myself, but Trey was kind enough to agree to guest blog about their book to any readers who might be interested in the subject. Trey, how would you describe your book to your prospective readers? In broad terms, what is your book about? Trey: Basically, this book series started as something I wanted to do with my son. At age two, he was really drawn to smart phones and electronic games. My wife and I knew we didn't want our two year old glued to an iphone, so we started telling him stories about things he was interested in. At the time, he was (and still is) into fire trucks, so I created a talking fire truck character that existed only in our minds for many months. As a birthday gift for him, I decided to begin indie publishing the stories for him and other children who were looking for a talking fire truck hero. Overall, these books, including the new title Mac The Fire Truck and The Airplane Fire, are about fun, heroism, and working together. Ana: What themes does your book explore and what do you hope the reader will take away from the experience? Is there a particular feeling or experience that you hope to evoke in the reader? Essentially, do you hope your book will mean to a reader? Trey: I really want children and their parents to have something fun to read on an ereader. I want kids to enjoy the quirky exploits of Mac The Fire Truck and be entertained, while at the same time expanding their vocabulary. Ana: What prompted you to write this book and did you have a specific inspiration in mind? Were you influenced by a certain author or work that inspired you to add your voice to this genre? Besides the boatloads of money and rockstar fame, what motivated you to write this book? Trey: As I mentioned earlier, my son was my inspiration for each story. He was the one who listened to the stories and loved them, and who was the real driving force behind the stories. He'll be four in September, and he still loves the stories. Ana: If you could compare your book to any other existing works, which ones would it be and why? If the one thing you could say to a prospective reader was, "If you like X, you'll love my book! ", which work would be invoked so that a reader could judge whether or not your book is their cup of tea? Trey: If your child (or you!) like stories with talking vehicles, such as John Seniza's Truck Town series, they will like these books. Ana: Is this your first or only published work, or have you published other books? If you have published other books, how do they compare to this one? Do you have any more books planned, either as a follow-up to this one, or as a completely different book or genre? 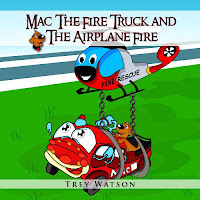 Trey: Mac The Fire Truck and The Airplane Fire is the 5th book in the series. I have a couple of other books published in addition to those. There are at least a couple of other books planned in the series. Ana: Where can readers obtain a copy of your book for them to enjoy? How can they contact you with any thoughts or questions? And do you have a means by which they can "sign up" to be notified when your next book comes available? 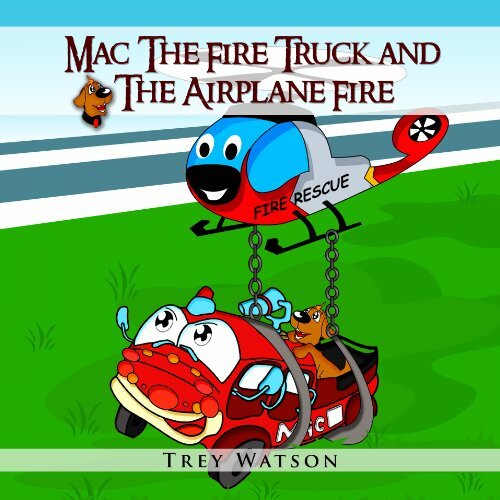 Trey: For now, Mac The Fire Truck and The Airplane Fire is available only on Amazon here. We are developing a website for the book where readers should be able to sign up for updates. Ana: Thank you. I understand you have the first chapter of your book available as an excerpt for interested readers? Is there anything else you wish to add for our readers? Trey: I appreciate you, Ana, for conducting this interview. The first part of the story is available on Amazon at this link. There will be a print version of this book available later in the month. If you are an indie author interested in being interviewed, please read the interview policy here. If you are an indie author interested in joining the Acacia Moon catalog, please visit the forums here. Author Interview: Anthony Caplan on "Latitudes"
Author Interview: Ray East on "Voluspa"